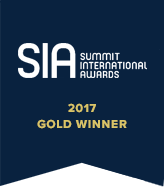 Boosting a local economy & winning awards. An active, collaborative partnership with Tourism Nanaimo had a profound impact on the city’s tourism industry. Shift perceptions from a drive-through city to a premier destination. Nanaimo has a deserved reputation as the Harbour City – it is perfectly central on the East coast of Vancouver Island. The issue came with the common opinion of people visiting the island – they considered it just a necessary place you have to go through to get to other destinations. The main goal of this campaign was to reposition the Nanaimo region as a destination in its own right, instead of merely a thoroughfare. We really wanted to encourage people to meet with friends and family, with nature, new experiences and more. As well, the stakeholders and businesses were integral to this campaign. We had many small businesses we had to consider when establishing the trajectory for our efforts and with the creation of every single piece of collateral. As well, it was important to consider the clear brand direction of Destination BC, the overarching tourism organization for the province. A welcoming branded campaign invites visitors & aligns marketing efforts. 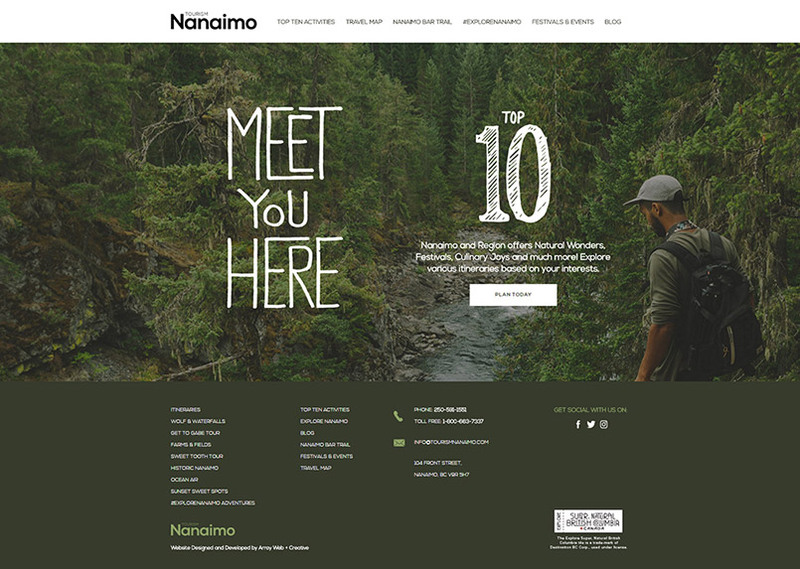 In order to reposition the Nanaimo region, we needed to establish a distinct identity for the campaign to be distinct from Destination BC while still complementing it. 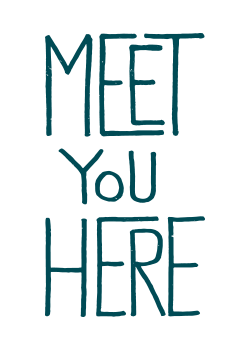 The development of the slogan “Meet You Here” positions the city as a place to get together with friends and family to be used across all forms of media, including print and digital ads. The custom wordmark utilized a muted green-blue, to emphasize the ocean, nature, and adventure. An integrated multimedia campaign to entice ecotourists & short-haul travellers. We utilized multiple communications strategies across a variety of channels – from Facebook and Instagram to digital billboards to 360° videos. By taking advantage of modern marketing tactics and partnerships with companies like Cabela’s, Nanaimo’s brand was showcased to millions of potential travellers in key target regions like Edmonton, Calgary, Vancouver and Seattle. The hashtag #meetyouhere – along with the Destination BC-aligned #explorenanaimo – were implemented to give people ownership for their region, encouraging them to discover their own path and experiences and to share them with the world. 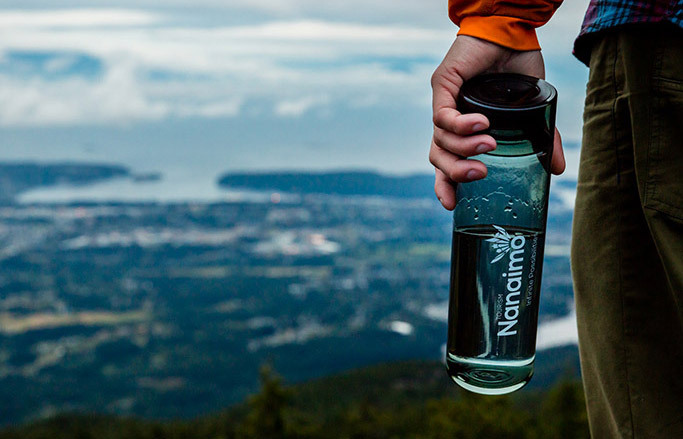 A social media contest was conducted, with a grand prize that offered the winner with the ultimate Nanaimo experience. A full-scale website with custom maps & itineraries encourage exploration. 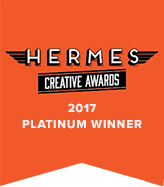 The website was one of the instrumental assets for the campaign, serving as the digital terminus for the majority of our advertising. By promoting the Top 10 Things to Do in the region, the intent was to have people explore the vast range of experiences and activities available for a wide range of tastes. Tens of customized itineraries were thoughtfully crafted to provide a comprehensive guide to outings in the area, filtered based on visitor’s selected interests. An Instagram feed was integrated to show off posts from those using the campaign hashtags, giving a dynamic, human element to the site. A sweet self-guided tour prompts residents & visitors to experience local. The Nanaimo Bar Trail was created in partnership with local businesses and stakeholders to showcase the incredible local establishments. We created a website that users can plan their own trip to take in the city’s namesake treat, and a print brochure for people to take along. Many creative – and even non-edible – iterations of the Nanaimo Bar were featured, and the “official” Nanaimo Bar recipe was established and hand-illustrated. 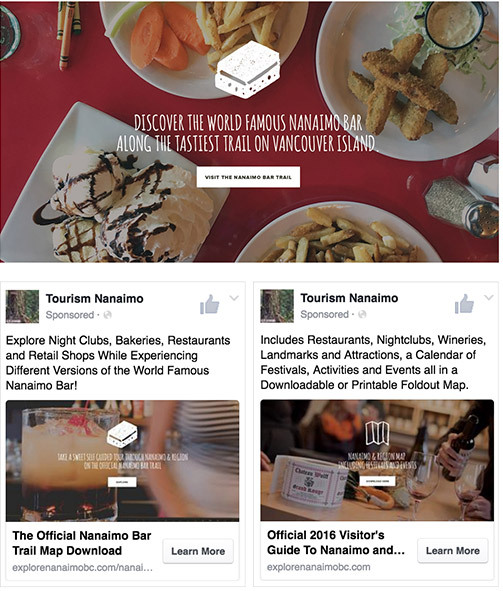 The whimsical design of the Nanaimo Bar Trail assets complemented the established campaign aesthetic. International recognition & putting Nanaimo top-of-mind. With this campaign, the website saw a ton of traffic, with thousands of desirable actions being taken on the website. The most popular itineraries downloaded from the website featured low-barrier opportunities to enjoy Nanaimo’s natural wonders, such as hikes to Ammonite Falls or sunrise watching at Yellow Point Lodge. 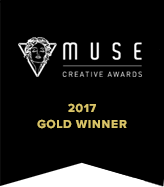 The success of this campaign is also quantified by global industry and creative professionals with a total of six award wins in 2016 and 2017 – check out our Awards section to see! Our team will get back to you ASAP about what budget a project like Tourism Nanaimo requires.